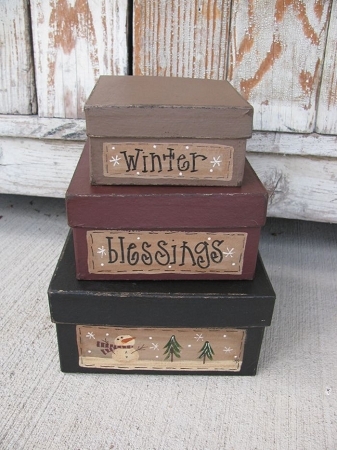 Primitive Winter Blessings Square Set of 3 Hand Painted Stacking Boxes. This is my winter addition to the seasonal square set of stacking boxes. I've taken a small set of square shaped paper mache boxes and designed them with a great winter scene. 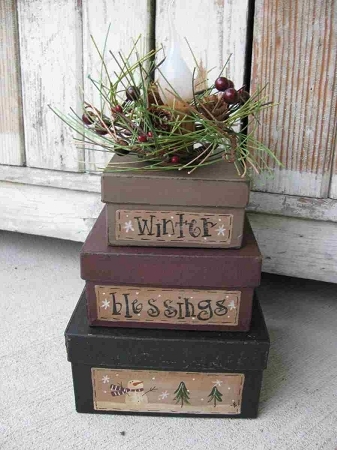 Perfect for small areas to add a seasonal touch. I've hand painted the bottom box black with a snowman scene, the middle box is burgundy with Blessings and the top box is dark taupe or Mississippi Mud with Winter on it. There is also an add-on option to make this set of stacking boxes into a light. The country candle lamp is attached only to the top box's lid. The wreath is not. The light stands 11" high including the bulb. Silicone bulb is included with purchase. The bottom box is 6"x6". The candle has been painted with a cinnamon mixture and a pine wreath has been added as well (wreaths may vary) Light cord has on/off switch. Hand painted and designed by Heidi.